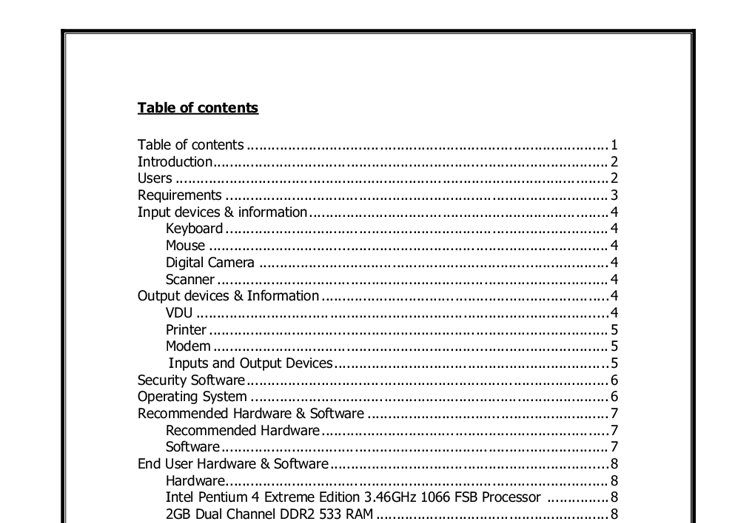 Table of contents Table of contents 1 Introduction 2 Users 2 Requirements 3 Input devices & information 4 Keyboard 4 Mouse 4 Digital Camera 4 Scanner 4 Output devices & Information 4 VDU 4 Printer 5 Modem 5 Inputs and Output Devices 5 Security Software 6 Operating System 6 Recommended Hardware & Software 7 Recommended Hardware 7 Software 7 End User Hardware & Software 8 Hardware 8 Intel Pentium 4 Extreme Edition 3.46GHz 1066 FSB Processor 8 2GB Dual Channel DDR2 533 RAM 8 NVIDIA GeForce 6800 GT 256MB PCI-Express Graphics Card 8 300GB SATA RAID Hard Drive 9 Creative Sound Blaster Live - 24bit Sound Card 9 Software 9 Microsoft Office 2003 9 Skype 9 Windows Vista Theme 10 Itunes 10 Mozilla Firefox 2.0 10 BIOS 10 Configuration Requirements 10 Configuration requirements 11 Toolbar layouts, menus, templates and macros 13 Introduction For this assignment I have been asked to create a computerised system for the DJ Company, Notorious Roadshow. The owners have specific needs, which I expect to meet. Notorious Roadshow is a company that allow dj's to hire out equipment. Up and coming dj's cannot afford their own equipment, and as a result of this they hire out the equipment. Due to lack of space as the company is ever expanding, Notorious Roadshow is opening a shop in the West London area. This is the main place of where dj's hire out the companies' equipment. Notorious Roadshow wants to stay local, and want to be in an easy to access area for their clients. Because of this the shop is to be opened in Southall, Middlesex. Currently, the administrative department is run from home. Clients pick the equipment from the houses that the equipment is stored. This is unsafe, as equipment is moving in and out constantly. Due to this the equipment is prone to be broken, or possibly even stolen. ...read more. Update Credential Manager Windows Messenger Personalized Welcome Screen Home Networking Fast User Switching Network Bridge Task-focused design Internet Connection Sharing Taskbar Grouping Internet Explorer Desktop Clean Up Wizard Internet-enabled games File management Experience Digital Music Indexed File System Auto-Recognition Files and Settings Transfer Wizard CD burning System Restore Scanner and Camera Wizard Clear Type Web Publishing Wizard Windows Movie Maker Order photo prints from the Internet These features are all updated from Windows 2000; however service pack 2 and XP Professional had the following new features which were: Internet Explorer Pop-up Blocker Windows Security Centre Internet Explorer download monitoring Windows Firewall update Internet Explorer Information Bar Windows Firewall simple compatibility setup Internet Explorer Add-on Manager Windows Firewall start up and shutdown support Windows Media Player 9 Series Automatic Updates enhancements Attachment Manager Improved wireless support DirectX update Bluetooth technologies The difference between XP Home and Professional is that Pro includes extended support for security between multiple users on the same machine. Recommended Hardware & Software I interviewed the employees of the company and I discovered that the system that the company needs is a system that can run very efficiently, be able to listen to music files with great simplicity and play, watch and modify images and video images. Recommended Hardware * Intel Pentium 4 Extreme Edition 3.46GHz 1066 FSB Processor * 2GB Dual Channel DDR2 533 RAM * NVIDIA GeForce 6800 GT 256MB PCI-Express Graphics Card * 300GB SATA RAID Hard Drive * Creative Sound Blaster Live - 24bit Sound Card Software In order to have a high specification computer system to work efficiently, the correct software must be installed. The software that I recommend which relates to the company's system is: * Microsoft Office XP * Skype * Windows Vista Theme * Itunes * Mozilla Firefox 2.0 End User Hardware & Software Hardware The types of hardware listed in the recommended hardware section (refer to 7.1.1) ...read more. I will configure the system so that the system automatically schedules tasks like scanning the computer for viruses at least once a week and doing a 'Disk Cleanup' weekly. Toolbars - The toolbars in all the software should be configured so that toolbars contain only the necessary buttons. Rom-BIOS - BIOS setting should be configures to meet the users needs. I will configure the date and time from the BIOS and create a password. I will also configure the boot device order. Data and Time - I will make sure that the date and time is correct. Language - I will configure the word processing language setting to English UK. Templates - I will create templates for documents like letter, property information sheets and other documents that will be used often so that users can edit these documents and don't need to produce them from scratch. The Templates will usual include the basic standard layout of the document. For example, I will create a template for a letter which will include the letterhead with the company's logo and address. Macros - I will create some macros for tasks that will be performed repeatedly so that a task can be accomplished automatically. Macros help speed up routine editing and formatting so this will make it much easier for the user as it will save time. Auto back-up copies - On word processing software I will configure the settings so that it automatically creates back-up copies for documents. Toolbar layouts, menus, templates and macros To make it easier and more efficient for the users I will be configuring the toolbars so that only all the necessary buttons are displayed on the toolbars in software like word processing software. I will also be creating templates for some of the business documents that are used often. These include documents like business letters, property information sheets, flyers, newsletters, etc. A macro is a programming tool that can be used to automate a series of tasks or procedures within a program. ?? ?? ?? ?? Tej Soor | Unit 4 | Candidate Number: 1132 | Centre Number: 13116 ...read more. I explained the frame rate used and explained that it seemed fit for purpose. Banner- I also produced an animated banner combining both text and a graphic. In this animation I included the name of the school the website is promoting and an image of a school bus. 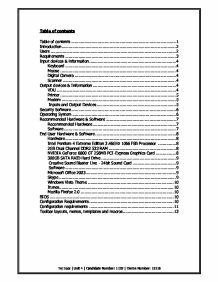 The upgrade looks at the state of your current upgrade and makes sure your computer system meets the requirements. You will also have to wait for this to load. This report shows you any potential issues that may hold back your upgrade. When you show commercial awareness it shows that you are committed to the work. Co-operative- these is when you work with others and work with them even though sometimes you may not agree with their ideas or point of views.